Beyond cross-border capital flows, international retail brands continue to land on U.S. soil for expansion and are targeting top-tier core markets for their storefronts. 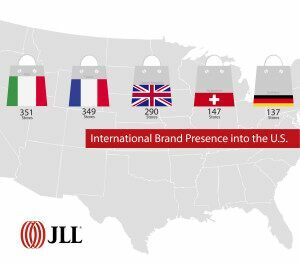 A diverse consumer base, buoyant income growth and a resilient economy has currently lured 175 international brands to take root in 19 top retail markets coast to coast, according to JLL’s latest report, The New World of Retail. European retailers have expanded most extensively into the United States with Italian, French, British, Swiss and German retailers crossing the pond most frequently. While there are challenges facing retailers and investors operating internationally, the benefits far outweigh the risks, according to the JLL report. “Borders are becoming irrelevant and in the coming decade, owners and occupiers of real estate will have a laser-focused approach on investment and expansion, creating portfolios with varied markets, risk and maturity,” concludes Caldwell. Categories: Agency Leasing, Americas Retail, Global, ICSC Events, Logistics / E-Commerce, Retail Transactions and tagged Bob Gibson, cross border, global, international, retailers.